MAHANAGAR LUCKNOW (NEAR RITZ RESTAURENT). Morning:10.00 A.M. TO 01.00 P.M. & Evening: 05.00 P.M. TO 9.00 P.M.
A dental implant is a substitute tooth root that serves the same function as a natural tooth root. It preserves bone and provides a stable foundation for a replacement tooth that look, feel and function like a natural tooth. Dental implants are made of titanium, which is a biocompatible material used in orthopedic implants. WHY ARE DENTAL IMPLANTS BETTER THAN BRIDGES, PARTIALS AND DENTURES? Dental implants can last a lifetime, unlike bridges, partials and dentures that may need to be replaced several times. Since dental implants prevent the bone resorption that occurs when teeth are missing, the natural appearance of the smile is preserved. With implant treatment, there is no compromise to adjacent teeth; they are not cut down to place a bridge, or loosened by the hooks on removable partials. Dentures and partials have the added disadvantage of accelerating the bone resorption process, which causes the appearance of premature aging. Your new replacement teeth will look, feel and function like natural teeth. And since implant treatment is the only solution that prevents bone resorption, which can cause your smile to look unnatural, the long term esthetics will be superior to any other treatment option. WHO IS A CANDIDATE FOR DENTAL IMPLANT TREATMENT? Nearly everyone who is missing one or more teeth and in general good health is a candidate for dental implant treatment. There are a few medical conditions that can undermine the success of implant treatment, such as uncontrolled diabetes. However, there are very few conditions that would keep someone from having implant treatment altogether. Quality and quantity of available bone for implant placement is more often a factor in qualifying for dental implants than medical conditions. However, even people who have lost a significant amount of bone can qualify for dental implant treatment with additional procedures to add bone or create new bone. Advances in this type of treatment have made it possible for most people who would not previously have been considered candidates to have successful implant treatment. 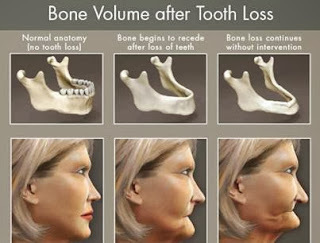 IS ANYONE EVER CONSIDERED TOO OLD FOR DENTAL IMPLANTS? Overall health and a desire to improve the quality of life are much more important considerations than age. When dental implants were first developed, back in the 1950's, implant supported replacement teeth were originally designed as a solution for older patients who were missing all of their teeth. Since then, many patients well into their nineties have had dental implant treatment without a single problem. As we have discussed in our previous article, the optimal amount of potassium in our blood serum is 3.5 to 5.0 mmol/L. whenever its level falls down below 3.5 mmol/L then the condition is known as Hypokalemia. Hypokalemia is also termed as hypokalemic syndrome, low potassium syndrome, hypopotassemia syndrome. Mild hypokalemia does not present any symptoms but if level of potassium falls below 2.5 mmol/L then it is classified as severs Hypokalemia and can pose life threatening complications. Hypokalemia can be differentiated into three types, and we will discuss their symptoms in these categories. Mild hypokalemia – level of potassium in blood serum from 3.5 mmol/L to 3.0 mmol/L can be termed as mild hypokalemia. This condition is symptom free and therefore difficult to trace unless someone is routinely getting his/her potassium levels checked. Urinary loss-patients who have uncontrolled diabetes have condition called polyuria meaning frequent urination. This can lead to hypokalemia. Patients who are on prolonged use of loop diuretics such as furosemide or blood control medication are often prone to loss of excessive potassium from body. A special case of potassium loss occurs with diabetic ketoacidosis. Hypokalemia is observed with low total body potassium and a low intracellular concentration of potassium. In addition to urinary losses from polyuria and volume contraction, also an obligate loss of potassium from kidney tubules occurs as a cationic partner to the negatively charged ketone, β-hydroxybutyrate. A low level of magnesium in the blood can also cause hypokalemia. Magnesium is required for adequate processing of potassium. This may become evident when hypokalemia persists despite potassium supplementation. Other electrolyte abnormalities may also be present. An increase in the pH of the blood (alkalosis) can cause temporary hypokalemia by causing a shift of potassium out of the plasma and interstitial fluids into the urine. Disease states that lead to abnormally high aldosterone levels can cause hypertension and excessive urinary losses of potassium. These include renal artery stenosis and tumors (generally nonmalignant) of the adrenal glands, e.g., Conn’s syndrome (primary hyperaldosteronism). Cushing’s syndrome can also lead to hypokalemia due to excess cortisol binding the Na+/K+ pump and acting like aldosterone. Hypertension and hypokalemia can also be seen with a deficiency of the 11-beta-hydroxysteroid dehydrogenase type 2 enzyme which allows cortisol’s to stimulate aldosterone receptors. This deficiency—known as apparent mineralocorticoid excess syndrome—can either be congenital or caused by consumption of glycyrrhizin, which is contained in extract of licorice, sometimes found in herbal supplements, candies, and chewing tobacco. In addition to alkalosis, other factors can cause transient shifting of potassium into cells, presumably by stimulation of the Na+/K+ pump. These hormones and medications include insulin, epinephrine, and other beta agonists (e.g. salbutamol or salmeterol), and xanthines (e.g. theophylline). Rare hereditary defects of muscular ion channels and transporters that cause hypokalemic periodic paralysis can precipitate occasional attacks of severe hypokalemia and muscle weakness. These defects cause a heightened sensitivity to the normal changes in potassium produced by catecholamines and/or insulin and/or thyroid hormone, which lead to movement of potassium from the extracellular fluid into the muscle cells. A handful of published reports describe individuals with severe hypokalemia related to chronic extreme consumption (4–10 l/day) of colas. The hypokalemia is thought to be from the combination of the diuretic effect of caffeine and copious fluid intake, although it may also be related to diarrhea caused by heavy fructose ingestion. Pseudo hypokalemia is a decrease in the amount of potassium that occurs due to excessive uptake of potassium by metabolically active cells in a blood sample after it has been drawn. It is a laboratory artifact that may occur when blood samples remain in warm conditions for several hours before processing. Fructose ingestion. Rare hereditary defects of renal salt transporters, such as Bartter syndrome or Gitelman syndrome, can cause hypokalemia, in a manner similar to that of diuretics. As opposed to disease states of primary excesses of aldosterone, blood pressure is either normal or low in Bartter’s or Gitelman’s. Blood test normally confirms hypokalemia. The levels of potassium are checked. if it falls below 3.5 mmol/L hypokalemia is diagnosed. Electrocardiogram- Hypokalemia leads to characteristic ECG changes (QRS prolongation, ST-segment and T-wave depression, U-wave formation). Remove causes: After identifying the underlying cause, your doctor will prescribe the appropriate treatment. For example, your doctor may prescribe medications to reduce diarrhea or vomiting or change your medication. Restore potassium levels: You can take potassium supplements to restore low potassium levels. But fixing potassium levels too quickly can cause unwanted side effects like abnormal heart rhythms. In cases of dangerously low potassium levels, you may need an IV drip for controlled potassium intake. Monitor levels during hospital stay: At the hospital, a doctor or nurse will check your levels to make sure the potassium levels don’t reverse and cause hyperkalemia instead. High potassium levels can also cause serious complications. After you leave the hospital, your doctor may recommend a potassium-rich diet. If you need to take potassium supplements, take them with lots of fluids and with, or after, your meals. You may also need to take magnesium supplements as magnesium loss can occur with potassium loss. Hypokalemia which is recurrent or resistant to treatment may be amenable to a potassium-sparing diuretic, such as amiloride, triamterene, spironolactone, or eplerenone. Concomitant hypomagnesemia will inhibit potassium replacement, as magnesium is a cofactor for potassium uptake. Mild hypokalemia (>3.0 mmol/L) may be treated by eating potassium-containing foods or by taking potassium chloride supplements in a tablet or syrup form (oral supplements). Foods rich in potassium include leafy green vegetables, avocados, tomatoes, coconut water, citrus fruits, oranges, or bananas. However, the quantities of potassium present in these foods are often not high enough to correct hypokalemia and additional potassium is generally required. Hope you enjoyed this part. Stay tuned for next.share with family and friends. MPD is a pain disorder characterized by spontaneous pain and jaw function-induced pain in the joint and muscles of mastication of the TMJ because of the interplay between the muscles and joints, a problem with either one can lead to stiffness, headaches, ear pain, malocclusion, clicking sounds, or trismus. “I want to take a bite” Anita snatched the apple from her husband’s hand and bit a huge hunk. ” click” a sound came from her jaw, nearby her ear. “yes, I’m also feeling them, but nothing to worry, may be some muscle soreness.” Anita ignored this for a while. But gradually the pain increased to significant level, accompanied by headache and neck pain so much, that they had to visit their consulting dentist. on examination their dentist told them that Anita was suffering from TMPD (temporomandibular joint disorder). doctor explained to him that there is a joint in their jaw known as temporomandibular joint which acts like a sliding hinge, connecting your jawbone to your skull. You have one joint on each side of your jaw. TMJ(temporomandibular joint) disorders — a type of temporomandibular disorder or TMD — can cause pain in your jaw joint and in the muscles that control jaw movement. he exact cause of a person’s TMJ disorder is often difficult to determine. Your pain may be due to a combination of factors, such as genetics, arthritis or jaw injury. Some people who have jaw pain also tend to clench or grind their teeth, although many people habitually clench or grind their teeth and never develop TMJ disorders. like Anita millions of individuals suffer and ignore the early signs of TMPDS and there by worsening it. TMPD is a pain disorder characterized by spontaneous pain and jaw function-induced pain in the joint and muscles of mastication of the TMJ because of the interplay between the muscles and joints, a problem with either one can lead to stiffness, headaches, ear pain, malocclusion, clicking sounds, or trismus. It is a common but misunderstood muscular pain disorder involving pain referred from small, tender trigger points within myofascial structures in or distant from the area of pain. The disorder and the resultant dysfunction can result in significant pain and impairment. Temporomandibular pain dysfunction syndrome (TMPDS) comprises a variety of signs and symptoms which may be present in any combination, dependent upon the progress and stage of the disorder. The diagnostic criteria are pain on palpation of the temporomandibular joint (TMJ), muscle tenderness on examination, joint sounds, and limitation or deviation of jaw movement on opening. Headache may also be a symptom. Physiotherapy is commonly used to treat this disorder but there is little published material in the field of clinical trials comparing different methods of physiotherapy. Most reports are anecdotal. This paper reports four different physiotherapy modalities in the management of TMPDS when compared with a placebo group. Short-wave diathermy, megapulse, ultrasound and soft laser were tested. TMJ disorders can also cause a clicking sound or grating sensation when you open your mouth or chew. But if there’s no pain or limitation of movement associated with your jaw clicking, you probably don’t need treatment for a TMJ disorder. The temporomandibular joint (TMJ) combines a hinge action with sliding motions. The parts of the bones that interact in the joint are covered with cartilage and are separated by a small shock-absorbing disk, which normally keeps the movement smooth. In mild case many times these pain go away on their own, but majority of cases need early diagnosis, and proper treatment. Treatment comprises basically of three parts i.e. prevention (identify the disease or disease causing conditions early and work on them), interception (interrupting the cause there by arresting the future deterioration of joint) and treatment (restoring the joint to its normalcy. the options can be non-surgical like splints, crowns to more complex like surgical intervention. Pain relievers and anti-inflammatories. If over-the-counter pain medications aren’t enough to relieve TMJ pain, your doctor or dentist may prescribe stronger pain relievers. Non-steroidal anti-inflammatory drugs (NSAIDs), such as ibuprofen (Advil, Motrin IB, others), are a mainstay of treatment. Tricyclic antidepressants. These medications used to be used mostly for depression, but now are sometimes used for pain relief. Muscle relaxants- These types of drugs are sometimes used for a few days or weeks to help relieve pain caused by TMJ disorders. Oral splints or mouth guards -Often, people with jaw pain will benefit from wearing a soft or firm device inserted over their teeth, but the reasons why these devices are beneficial are not well-understood. Physical therapy- Treatments might include ultrasound, moist heat and ice — along with exercises to stretch and strengthen jaw muscles. They have proved useful in reducing the pain. Arthrocentesis. Arthrocentesis is a minimally invasive procedure that involves the insertion of small needles into the joint so that fluid can be irrigated through the joint to remove debris and inflammatory byproducts. Injections-botulinum toxin has found its way into medical practices decades ago. Now they and steroids are used to relieve TMJ pain. In some people, corticosteroid injections directly into the joint may be helpful. Infrequently, injecting botulinum toxin type A (Botox, others) into the jaw muscles used for chewing may relieve pain associated with TMJ disorders. TMJ arthroscopy- In many cases, arthroscopic surgery can be as effective for treating various types of TMJ disorders as open-joint surgery. A small thin tube (cannula) is placed into the joint space, an arthroscope is then inserted, and small surgical instruments are used for surgery. TMJ arthroscopy has fewer risks and complications than open-joint surgery does, but it has some limitations as well. Modified condylotomy. Modified condylotomy addresses the TMJ indirectly, with surgery on the mandible, but not in the joint itself. It may be helpful for treatment of pain and if locking is experienced. Open-joint surgery. – Considered by some as last resort. If your jaw pain does not resolve with more-conservative treatments and it appears to be caused by a structural problem in the joint, your consulting oral surgeon or dentist may suggest you to go for open-joint surgery (arthrotomy) to repair or replace the joint. However, due to its strategic presence near bifurcation of facial nerve and other anatomic structures open-joint surgery involves more risks than other procedures do and should be considered very carefully, discussing the pros and cons. The story of Anita and Anand is just an example that how clicking sound, pain in biting and other early symptoms of your jaw discomfort should not be ignored and brushed aside. A normal medical checkup can inform you about your conditions and management. individuals should never shy away from a diagnostic checkup if they think something is not right. “stitch in time, saves nine” that’s an old proverb but fits beautifully here. catching the disorder in its infancy will make sure that individual will not suffer. read it and share it with your loved ones if you really care. Dental implants were present from decades but from last 15 yrs it had carefully cemented and consolidated its position as best tooth replacement option.it has been established its place in developed countries but in developing countries like India,Pakistan,Mexico,South Africa it is now considered as a definitive tooth replacement option.but what happens as new patients does not have much information about the procedure and implants they are quite apprehensive.just to answer there basic queries is the aim of this blog.now what are these queries? Dental implants are and can be described in a layman term as a screw which is planted in the bone to which a teeth is attached.now to describe it.a noble material "root-form" implant is surgically placed in the position where earlier root of your exisiting tooth was.it is left to osseointegrate i.e. 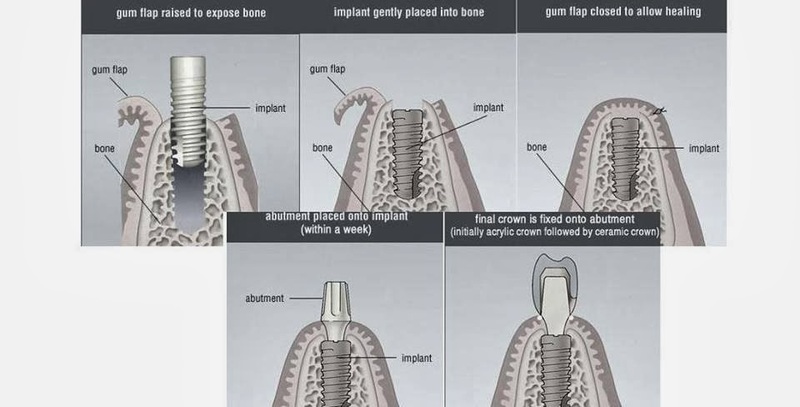 development of bone around the implant.it takes normally 3 to 4 months.after osseointegration is completed , an abutment or a crown portion is attached and on that a tooth is fixed.nowdays even after one week of implant placement ,a temporary crown is given which s replaced by permanent crown after 3 months. above is a image description about different levels in implant surgery. who are candidates for implant surgery? any person who is fit for dental extraction is a case for dental implant given he passes above conditons.however a reference with your consulting dentist should be done.some dentist offer it free .u can contact at www.ramadentalclinic.com for free consultation. SURGERY WORD MAKES ME NERVOUS.IS IT A PAINFUL SURGERY? WHY IS IMPLANT SURGERY EXPENSIVE AS COMPARED TO OTHER TREATMENTS? implant surgery is not expensive when u see it in long term success rate.if properly maintained its a one time investment which is going to serve you for lifetime.as implant is made of noble metal like titanium it increases the cost.as noble metal does not react and cause infection ,they are considered as best options for surgery,plus there is a surgery cost.all the surgical protocols are follwed for a sterile enivironment required for the surgery.in growing countries earlier dental surgeries were not considered as important as nose or ear surgery,a concept which was accentuated by a large number of "QUACK" dentist working here.but now concepts are changing and charges are cost -effective.when u will consider that our organ is getting replaced rather then getting a additional tooth your prespective will change. dental implant are fixed prosthesis.prosthesis means its not natural.dentistry says that u need to take care of your natural teeth also,else they will be damaged.same goes with implants.u dont need any special care for them but you need to take basic care of your teeth and implants.which is properly cleaning,flossing,mouthwash and regular check up at your dentist.if u dont clean for your teeth u get periodontitis,if u dont clean aroung your implant u get peri-implantitis, both affect stability of teeth and implants. WHAT IS OSSEOINTEGRATION OF IMPLANTS? 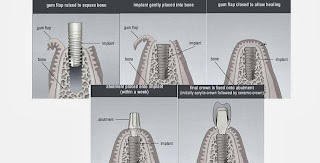 osseo-integration means bone integration of implant .that is impant surface have tendency ti stimulate bone forming cells which leads to deposition of bone around implant.this aids in stability of implant and preservance of your jaw bone height.osseointegration a key part in success of your dental implant. 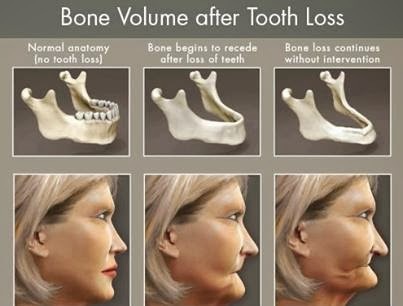 The jaw bone is basically made up of two type of bones cancellous and alveolar bone.alveolar bone is your dental socket forming bone and as soon as teeth are lost they tend to resorb,thus by shrinking your jaw bone whereas basal bone does not resorb.the benefit of implants are that they keep jaw bones from shrinking thus maintaining your face heaight,volume and esthetics. when is the right time to get implants? the right time can be decided by ur consulting dentist.nowdays immediate implant placement at the time of teeth extraction is also done.in few cases this is done after 3-4 months of dental extraction.consult ur dentist for exact timing. for more information right to me or visit www.ramadentalclinic.com.patient pics used in this blog is taken from www.ramadentalclinic.com and graphic pics from internet. Every tooth in a man's head is more valuable than a diamond. ~Miguel de Cervantes, Don Quixote, 1604.
a news is viral these days about remursement of root canal treatment of an AP minister of rs 2.9 lakhs. Andhra Pradesh Government issued a GO Reimbursing a medical claim Rs 2,88,000/ to the Finance Minister for the Root canal Treatment, he took on 12 April 2018 in Singapore. the cost difference is huge in comparison to indian dentist.we regularly recieve foreign patients in our clinic from many countries and many from singapore.we recently published a blog of dental implant surgery treatment given to singapore resident.we proudly state that we charge same amount from indian as well as NRI or foreigners visitng us for dental treatment as a part of dental tourism initiative.we at rama dental clinic & dental implant centre are constantly been reciepient of awards, accolades , recognition, ISO 9001:2015, certified by Quality council of india which are certifying body for National Accredition Board for Hospitals & Healthcare .(NABH). we were chosen as top cosmetic dental clinic of india by SILICON india 2018.we work hard to maintain the quality standard yet maintaining it with humblessness. if you are looking for good dentist, dentist in mahanagar lucknow contact us. Dental implant is a sterile, biocompatible and osseointegratable root part of your teeth. This is inserted inside your bone.it bio-integrates and joins with your jaw bone on which a tooth can be placed. This implants serves as “root” for your teeth’s crown. It is considered as one of best options to replace missing teeth and serve you for your whole life if certain precautions and guidelines are followed. Normally teeth are surrounded by “alveolar bone” or let’s call it teeth bone. As your tooth is extracted the bone starts resorbing. the resorption of bone is faster if you have any underlying diseases like diabetes, osteoporosis or any malnutrition. Or if you are wearing removable dentures, which exerts direct force on jaw, there by speeding their resorption. Dental implants promote bone growth by Osseo integrating. They act as root forms for crowns and upon them tooth is cemented or screwed. Cost of dental implants can’t be just streamlined into a standard cost for every patient. sometimes there are additional adjunctive treatments are done to stabilize the implants depending upon the bone defects and available bone volume .procedures like bone grafting, direct or indirect sinus lifts, connective tissue grafts, PRF procedures often accompany implant surgery. the exact cost of dental implant can be predicted following checkup of your mouth.at Rama dental clinic we regularly organize free implant surgeries and subsidized implant surgeries for the poor sectors as our social responsibility. The success rate of dental implants are very high as comparaing to its other two cousin (removable dentures and teeth supported bridges) given that proper care is followed. If properly taken care of, dental implants can last you for a very long time in your mouth. A tale of smile design. A very gorgeous lady approached us for his broken teeth.on inspection we found out that her central incisor (front teeth) edge was broken.making it look asymmtrical. Now the problem.was that filling on edge of the tooth which are very small,does not show great strength and can often wear off while biting.giving her crown or veneer will still need reducing her existing natural teeth.shade matching was our another concern.however we decided to go with composite veneering, using enamel and dentin shades we finally matched it to her existing teeth.a mock up was done and on her satisfaction was finalized.attached pic is pre and post operative pics of the tooth in question.total transparency is matched with the adjacent tooth. teeth and implant in a day. we received a call from Singapore. A WhatsApp Message to be more preicise.it was about dental implants. the patient introduced us as a native of india , currently working in Singapore. He had mobile front teeth.it was elongated and posed not a very great smile profile. He was advised for teeth removal. He inquired us about the cost and procedures. All his queries were answered to the best of doctors ability. He was convinced and treatment was planned. The day of surgery he arrived in India and came to the clinic. We talked. He said and we quote “doctor i have not smiled from a very long , want to smile again." 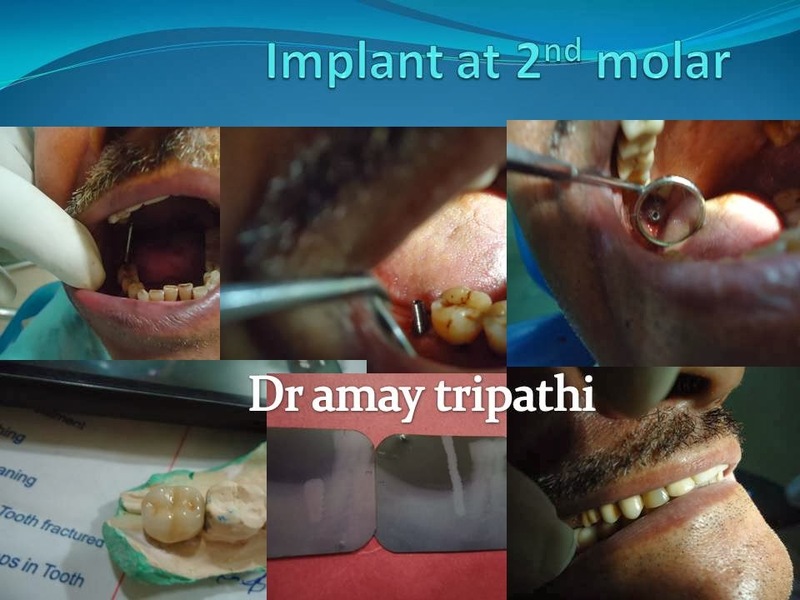 to this our doctor Dr Amay Tripathi replied "you will smile today"
his teeth was extracted, dental implant done via "teeth in an hour" technique. His natural extracted tooth was used as a temporary teeth and immediately fixed. After doing this patient was given mirror. Patient was surprised seeing his near perfect smile. He was smiling without any effort for our pictures. We drew into conversation and he disclosed that when he entered the clinic from outside he was not sure that weather this complicated procedure could be carried out successfully at our Centre. But it was so smooth and painless that he could not believe it. this also gave us a clue that we have to make our clinic more fancy from outside to make patients believe in us(just kidding).he complicated us for our advance machinery and latest equipments. he also wrote as a nice testimonial. Hearing these nice words certainly boosted our morals and we consider this as the greatest payment which we can receive. we have devoted our life for dental implants, and receiving good reviews after treatment is like getting payback for life's work. (i m getting a little emotional. Please pardon me) anyways a case successfully completed. The story is in pics below. Identity of the patient has been withheld. if you are looking for dental implants solution in Lucknow, dentist in hazaratganj, dentist in Mahan agar, dentist in gomti nagar, dentist in alambagh, dentist in aashiyana. dental implants procedure, dental implant cost, painless treatments, look no further. We at rama dental clinic and dental implant center will take care for it. at Rama dental clinic & implant centre,best dental clinic in lucknow, we recently treated super seniour citizen for full mouth dental rehabilitation.with minimally invasive tchniques and patients cooperation , we were able to deliver him full mouth fix solution in mandible and removable overdenture in maxilla, and not extracting his front incisors which he wanted to retain, to his fullest satisfaction. we understand that our seniour elderly are short of budget, as they have devoted there life for society, so this was our turn to ay them back.discussing wit them there fears, concerns and apprehensions and not to forget budget, we devised a treatment plan for him. all required diagnostic checkup were done and founding everything in order, we commenced with the treatment plan.considering and safeguarding ,all risk that could be encountered. in the end we were able to deliver to him his set of new teeths, with whom he ate his food.2 to 3days was taken for him to get used to it ,and couple of adjustments but finally we were able to deliver it to his satisfaction. the final pic of his smile, brings us ultimate satisfaction .this is not only a photgraph but is a small story of trust, satisfaction and fulfillment.he blessed us with his blessings and believe me those are our best payment recieved. free dental implant placement at our clinic. As our responsibility towards society we placed free dental implant to an unerprivilaged patient at our Lucknow centre of Rama dental clinic and imlant centre.we feel great.we have decided that from time to time we will place free implants.patient was not charged for anything.not for implants, crowns or even consultation.we are only clinic in uttar pradesh doing this as a charity.enroll yourself for our program.every month one suitable underprevailaged patient is selected and free implantation is done.we are proud of our venture and want you to help us in doing this.if the patient is has BPL card or has yearly salary less then 1 lakh per annum is entitled for one free dental implant.it may include pensioners and seniour citizens too.if you are looking for dentist in mahanagar, dentist in gomti nagar,dentist in nishatganj, dentist in hazratganj,dentist in lucknow look no further.contact us.there are many options available on internet which can confuse you .but our experience, clinical skilled hands and indepth knowledge of subject makes us leader in field of dental implantology.we have hundreds of satisfied patients all over the globe, who come to us by referral and search.we have databank of our real patients whith there original testimonials and not fabricatd ones desined by SEO teams.dr amay tripathi himselfdoes the surgeries and answers all your queries in detail.we provide you easy plans and financial options ,so that getting dental implants dont become a nightmare for you.you all have facility to pay in EMI .this is our confidance.our patients trust us and so we trust our patients. we believe in ultimate philosophy which is taught to every medical practitioner all around the world that is"we treat and God heals" .we dont offer you guarantees and warrantees which are not more then marketing gimmicks and even "UNETHICAL" for medical practitioners.but we offer you honest treatment which have probability of lasting more then these so called guarantees. © Rama Dental Clinic & Implant Centre, Lucknow, India. 546/528 MAHANAGAR GOL MARKET CHAURAHA, MAHANAGAR LUCKNOW.